Northeast Frontier Railway has taken a quantum jump towards safety on Thursday by eliminating all unmanned level crossings through various means. This has been done to ensure safety of precious human lives. As on 1st April this year, a total of 151 unmanned level crossings elimination were planned and despite very stiff target and ongoing monsoon, all 151 unmanned level crossings have been eliminated. Out of the total 151 numbers eliminated, were 136 unmanned level crossings eliminated by manning, 10 unmanned level crossings were eliminated by construction of road under bridge and five unmanned level crossings eliminated by direct closing. It is to be mentioned that under the direction of Union Minister of Railways, Piyush Goyal, all the zones were to eliminate unmanned level crossing by March 31 next year. By Thursday’s feat, N F Railway becomes one of the first railways to achieve this target ahead of the stipulated time. 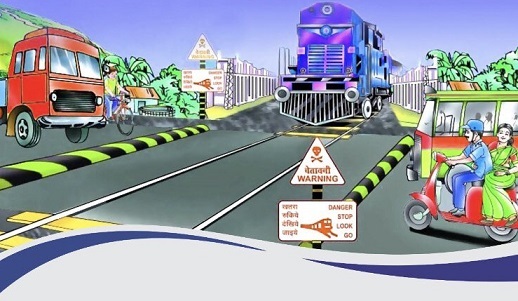 Unmanned level crossings are considered one of the weakest links in the safety preparedness of Indian Railway as a considerable percentage of accidents have taken place due to carelessness of road users at these unguarded crossings. This is the reason why N F Railway had targeted the elimination of unmanned level crossings on mission mode. West Central Railway, Central Railway, Eastern Railway and South East Central Railway aggregating 11,545 route kilometers have also become unmanned level crossings free on broad gauge route, according to Railway Ministry sources.